Check out what one of the hottest new bands of the moment got up to backstage at this year's Summertime Ball 2012. 1. 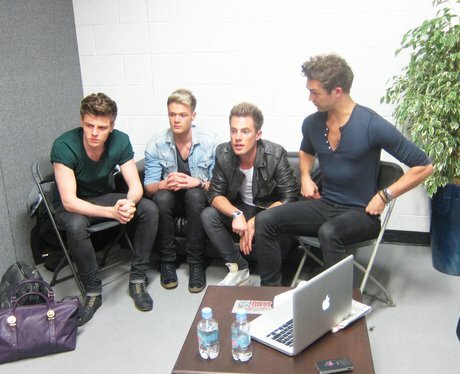 Lawson relax backstage at Wembley Stadium while preparing for their debut performance at the venue. 2. Lawson's Andy Brown and Joel Peat pick out their stage oufits ready for the Summertime Ball 2012. 3. Lawson get styled, suited and booted before performing in front of 80,000 fans at Wembley. 4. The 'When She Was Mine' singers go over last minute preparations for their Summertime Ball set. 5. Lawson guitarist Joel Peat takes time for a last minute mirror check before heading out to perform. 6. Lawson bassist Ryan Fletcher gets a quick haircut behind the scenes ahead of the Ball. 7. Lawson talk Summertime Ball tactics backstage at Wembley Stadium. 8. Lawson singer Andy Brown relaxes with his iPad at this year's Summertime Ball. 10. Lawson singer Andy Brown takes a seat for his turn in the make-up chair ahead of their performance. 11. Lawson bassist Ryan Fletcher gets kitted out for the band's biggest ever performance. 13. Ryan Fletcher relaxes at Wembley Stadium after rehearsing for the band's performance. 14. Ryan Fletcher takes a seat to get ready for Lawson's debut at the Summertime Ball 2012. 15. Lawson's debut at the Summertime Ball 2012 saw them perform first single 'When She Was Mine'.